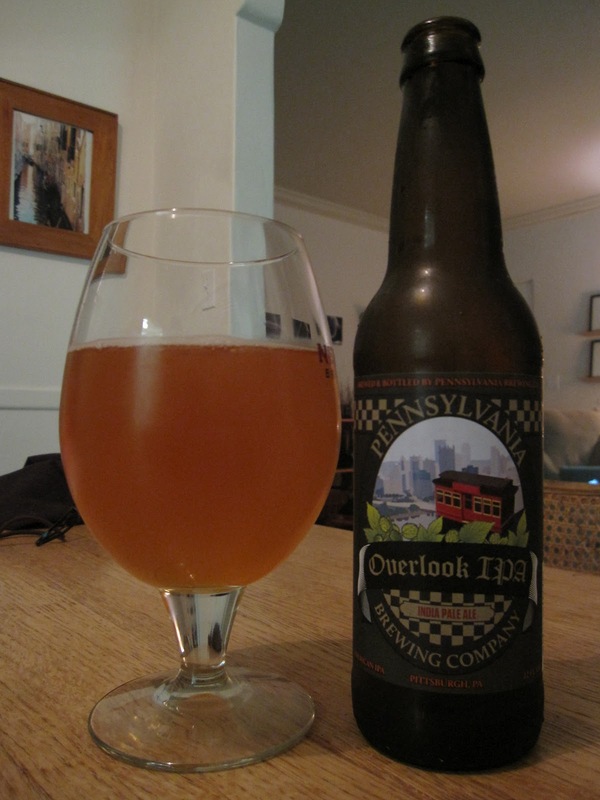 Not sure how many Pennsylvania beers we've reviewed around here. I can't think of any off the top of my head. Oh, wait, Lancaster Amish Pale and Milk Stout. Those were pretty good. So Pennsylvania's doing OK so far. This one's a seasonal IPA from the accurately but dully named Pennsylvania Brewing Company, or Penn Brewery for when you're sick of writing 'sylvania'. I have to admit that I cracked into one of these in a fridge raid a couple of weeks ago and was not a fan. But let's see how it does under the tighter scrutiny of the reviewoscope. It's surprisingly west coasty in color- pale yellow/orange rather than the red/amber I've come to expect from these eastern IPAs. The smell is kind of odd. There's not a whole lot of malt oomph, which I like. But the hops come off more astringent than anything else, there's not much florality or citrus or anything else in there. When you get right down to it, it smells kind of nasty, more like a glass of diluted ammonia than a tasty beer. Yeah, not so good. The flavor's in line with the nose- very light body, but a major excess of bitterness without much redeeming hop flavor. Or much flavor at all, for that matter. It just tastes bitter, almost bile-ish, and if there's anything else there, it doesn't stand a chance in hell. Oh, and as it warmed a bit, the nose took on a Brett Dream-like piss odor. Awesome. Overall, probably the worst of the craft beer club beers. Give me a bad red ale over this any day.